September 14 — The Exaltation of the Holy Cross - Feast - My Catholic Life! If the Romans had hung criminals from a gibbet, then Catholic churches would display a noose in their sanctuaries instead of a cross. Jesus’ lifeless body would be shown hanging from a sturdy branch with a rope wrapped tightly around His neck. If the Romans had practiced stoning as their chosen form of capital punishment, then there would be a pile of rocks for the congregation to gaze at in hope, with Jesus’ body, bruised and broken, lying lifeless nearby. We are accustomed to the cross. We wear it around our necks, chisel it onto our tombstones, tattoo it onto our arms, and anchor it into rocky mountain peaks. We even top our steeples with the cross and illuminate it at night. The Church has been so spectacularly successful in communicating its truths about suffering and death, about resurrection and life, that we perhaps don’t notice that over long centuries a device of torture and death has been reinterpreted as the world’s greatest symbol of life and peace. God’s self-emptying started at the incarnation. He humbled himself to walk among us, when He restricted Himself to the limitations of His own creatures. God continued to pour Himself out until He climbed the wood of the Cross, completing the total self-gift that was His life. Our God is not like a general who sends a subordinate to carry out a dangerous mission, like an absent parent who pays someone else to raise his children, or like a physician who coldly touches his patient’s body and then washes in antiseptic. No, our God is like a surgeon who, before he cuts, points to his side and says to the patient with empathy, “I had the same—see my scars.” Our God points to the wound in His open side and says, “I too was the victim of evil and death.” God bore the Cross and its cruel death so that He could drink from the same bitter cup as man, so that He could enter more fully into the world’s sorrow. Death on the Cross was not preordained. God could have freely chosen other ways to redeem the human race—through intelligence, wisdom, charm, money, education, or other means. But then, to participate in His redemption, we would have to study for a PhD, attend etiquette school, get a good job, earn an excellent wage, or receive good grades. Not everyone can do these things. But everyone can die. Death is egalitarian. Everyone does it. So God did it, and “so made the grave a sign of hope even as it claims our mortal bodies,” as the graveside prayer states. The Cross, then, is everyone’s trophy, raised high with one arm, head cocked to the side. It is in this sense that the Cross is a sign of hope. Because the Cross lost the fight with Christ, death is not the final answer. The Cross says that our God does not answer the question of suffering and death in a partial academic way. He responds in a total human way. He responds with His life. He doesn’t explain; He shares. He responds with empathy by taking up His Cross and inviting us to do the same. Jesus Christ, Your three hours on the Cross gave that wicked device a new meaning. Through contemplation of Your sufferings, may we transform all the wickedness and sin in our lives into something valuable. May we convert evil, transform sin, and, like You, go from death to life. GOD having restored peace to His Church, by exalting Constantine the Great to the imperial throne, that pious prince, who had triumphed over his enemies by the miraculous power of the cross, was very desirous of expressing his veneration for the holy places which had been honored and sanctified by the presence and sufferings of our blessed Redeemer on earth, and accordingly resolved to build a magnificent church in the city of Jerusalem. St. Helen, the emperor’s mother, desiring to visit the holy places there, undertook a journey into Palestine in 326, though at that time near eighty years of age; and on her arrival at Jerusalem was inspired with a great desire to find the identical cross on which Christ had suffered for our sins. But there was no mark or tradition, even amongst the Christians, to show where it lay. The heathens, out of an aversion to Christianity, had done what they could to conceal the place where Our Saviour was buried, by heaping on it a great quantity of stones and rubbish, and building on it a temple to Venus. They had, moreover, erected a statue of Jupiter in the place where Our Saviour rose from the dead. Helen, to carry out her pious design, consulted every one at Jerusalem and near it whom she thought likely to assist her in finding out the cross; and was credibly informed that, if she could find out the sepulchre, she would likewise find the instruments of the punishment; it being the custom among the Jews to make a hole near the place where the body of a criminal was buried, and to throw into it whatever belonged to his execution. The pious empress, therefore, ordered the profane buildings to be pulled down, the statues to be broken in pieces, and the rubbish to be removed; and, upon digging to a great depth, the holy sepulchre, and near it three crosses, also the nails which had pierced Our Saviour’s body, and the title which had been fixed to His cross, were found. By this discovery they knew that one of the three crosses was that which they were in quest of, and that the others belonged to the two malefactors between whom Our Saviour had been crucified. But, as the title was found separate from the cross, it was difficult to distinguish which of the three crosses was that on which our divine Redeemer consummated His sacrifice for the salvation of the world. In this perplexity the holy Bishop Macarius, knowing that one of the principal ladies of the city lay extremely ill, suggested to the empress to cause the three crosses to be carried to the sick person, not doubting but God would discover which was the cross they sought for. This being done, St. Macarius prayed that God would have regard to their faith, and, after his prayer, applied the crosses singly to the patient, who was immediately and perfectly recovered by the touch of one of the three crosses, the other two having been tried without effect. St. Helen, full of joy at having found the treasure which she had so earnestly sought and so highly esteemed, built a church on the spot, and lodged the cross there with great veneration, having provided an extraordinarily rich case for it. 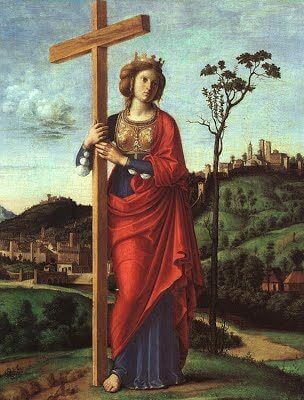 She afterwards carried part of it to the Emperor Constantine, then at Constantinople, who received it with great veneration; another part she sent or rather carried to Rome, to be placed in the church which she had built there, called Of the Holy Cross of Jerusalem, where it remains to this day. The title was sent by St. Helen to the same church, and placed on the top of an arch, where it was found in a case of lead in 1492. The inscription in Hebrew, Greek, and Latin is in red letters, and the wood was whitened. Thus it was in 1492; but these colors are since faded. Also the words Jesus and Judæorum are eaten away. The board is nine, but must have been twelve, inches long. The main part of the cross St. Helen inclosed in a silver shrine, and committed it to the care of St. Macarius, that it might be delivered down to posterity, as an object of veneration. It was accordingly kept with singular care and respect in the magnificent church which she and her son built in Jerusalem. St. Paulinus relates that, though chips were almost daily cut off from it and given to devout persons, yet the sacred wood suffered thereby no diminution. It is affirmed by St, Cyril of Jerusalem, twenty-five years after the discovery, that pieces of the cross were spread all over the earth; he compares this wonder to the miraculous feeding of five thousand men, as recorded in the Gospel. The discovery of the cross must have happened about the month of May, or early in the spring; for St. Helen went the same year to Constantinople, and from thence to Rome, where she died in the arms of her son on the 18th of August, 326. CONSTANTINE was still wavering between Christianity and idolatry when a luminous cross appeared to him in the heavens, bearing the inscription, “In this sign shalt thou conquer.” He became a Christian, and triumphed over his enemies, who were at the same time the enemies of the Faith. A few years later, his saintly mother having found the cross on which Our Saviour suffered, the feast of the ” Exaltation” was established in the Church; but it was only at a later period still, namely, after the Emperor Heraclius had achieved three great and wondrous victories over Chosroes, King of Persia, who had possessed himself of the holy and precious relic, that this festival took a more general extension, and was invested with a higher character of solemnity. The feast of the “Finding” was thereupon instituted, in memory of the discovery made by St. Helena; and that of the “Exaltation” was reserved to celebrate the triumphs of Heraclius. The greatest power of the Catholic world was at that time centred in the Empire of the East, and was verging toward its ruin, when God put forth His hand to save it: the re-establishment of the great cross at Jerusalem was the sure pledge thereof. This great event occurred in 629.